Andrew Goldsworthy art installations at The Presidio English artist Andrew Goldsworthy currently has three permanent installations here. ●Spire Open daily. Installed in 2008, this work consists of the trunks of 37 Monterey cypress trees from the Presidio that were selected and felled because they were declining. 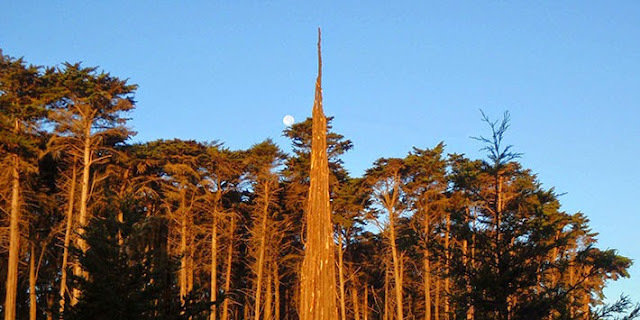 The trunks are bound together to form a 95-foot-tall spire with a 15-foot-wide base. ●Tree Fall 95 Anza Ave., (415) 561-2767. Sat-Sun 10-4. Located inside the historic Powder Magazine building featuring 4-foot-thick stone walls, this 2013 installation plays with what is beneath the ground. A tree trunk covered in dried cracked clay is suspended inside without touching the walls and is viewed without any artificial light. update Feb. 9, 2015: A fourth Goldsworthy installion is now in place. Very cool, Carole! Thx for sharing this with us. I really love the look of the Wood Line foot path. San Fran has so many amazing attractions to inspire us! I've never heard of this and we lived in the bay area for 33 years - my bad! Such a beautiful part of the country, one never gets tired of visiting the CA coastline and the abundance of trees. I only knew about one of them before the day of my recent visit. I was quite surprised, too. Those art installations are amazing! We usually visit San Fran every summer to play with the grandkids. We'll definitely add this to our must see list with the family. We visit the San Fran every summer to play with the grandkids. We definitely add this to our must see list. The spire is very interesting. What an interesting and beautiful way to use the declining cypress trees. I visited Marin County just outside of San Francisco. It was fabulous and I can't wait to go back and see more of the city. Lover's Lane looks amazing! Excellent find! Your poetry is a complement to the artistry, Carole. Thank you for the kind words about my poetry! It is the result of a writing exercise I participated in after the walk and viewing. I visit SF very often - You have inspired me to see some things I have never seen before! Thank you! Loved your poem too, very charming! I love Wood Line! Magical! !